It's always comfortable to find how tips that I have posted here have helped other with their performance issues. Today I found this very nice article written by Jenneth Orantia where she talks about how to optimize a Asus R2H. WOW!!! Ok, I do not believe that we are going to see 11 hours, sorry Linda, but I have to say this. But even if what we see is the 60% of this time, we are talking about more than 5 hours of battery life all fitting in a 3.5 pounds package! That's just unbelievable! Like always, Linda has posted a very nice pictures of this machine, go and check them here. Weighing in at 3.5 pounds with up to up to 11 hours of battery life, the new Fujitsu T2010 Tablet PC is housed in black case with what appears to be just a touch of lack metallic on the top. This machine is built to meet the needs those who work indoors and out and are always on the go. It would be a great Tablet PC for students at Pepperdine Malibu or any other university where students are known to study on the beach and on outdoor decks. Let me begin by thanking you for your participation and support of our new forums – with your feedback and that of your peers we can work to improve current and future models, so please keep the discussion rolling. Now to clarify a couple of misconceptions posted here. The eo i72XX series is not from Founder, it was a Intel Reference design manufactured by a company called Elite Computer Systems (ECS) – Founder is a ODM much like TabletKiosk, which was granted the distribution rights for this model from Intel. This unit was awarded the “Vista Compatible” medallion by Microsoft, and unfortunately Microsoft’s requirements for the Vista operating system exceed their initial hardware target goals, once this O/S was formally released – causing the lack of formal Windows Vista support of this and similar devices by the ODM’s . Aero, blame on Aero, that simple cosmetic feature, no needed, stupid, resource consuming, etc, etc, has caused more problems than all the bugs of the whole Vista. 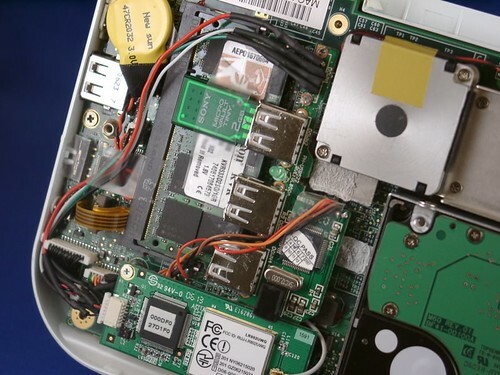 Just because the i7210 was not capable of running Aero the Vista Capable "medallion" was gone and the interest in supporting the series was gone with it. Add to that Intel not selling the Pentium M any more and you have the perfect formula for disaster. Well, there has been a group of persons contacting Founder asking for Vista Support. Back in April 2007 we had some feedback from this company. Now we know that we were contacting the wrong guys. It's time to turn our guns to ECS. 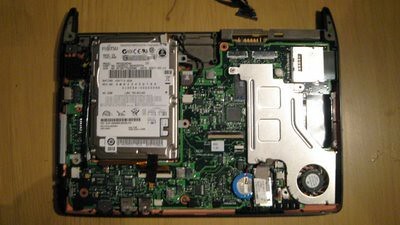 As far as I know there are two major issues in the i7210 series, the lack of support for the SD Reader and an issue when the device comes back from Hibernation. If anybody wants to give me more details, my forum is open. The response to the GottaBeMobile Reader Meetup has been really good. We've gotten a great response from OEMs and ISVs with plenty of giveaways. In fact, I just received a box from Lenovo containing 20 2 gb flash drives. Active Ink Software is donating a license of their software, Forms2Base is donating a license of their software, Allegiance Technology Partners is sending some good stuff, TabletKiosk, Microsoft, Samsung, Otterbox, and Motion Computing are getting in on the action, too. We have tons of shirts and stuff coming in from HP, OQO, TechSmith, Bluebeam, and more. GraphicResults.com is donating some specially made GBM T-Shirts for us, too. Wow - I'm gonna need a truck to get all that stuff to Pikes Perk. They are going to give away some good stuff so if you are near Colorado Spring do not miss this opportunity! Warner has written a very good article summarizing the options for those in the market looking for UMPC. I’ve been giving some thought to what comes next for me regarding an Ultra-Mobile PC. There are a lot of shiny new options out there, but I have to admit it is tough going looking through the options available and comparing them to my needs. For what it is worth, I’m sharing my thoughts here. Share your responses if you care to. I have to say that I fully agree with Warner. I currently have the eo v7110 and the Q1 and I have not seen anything in the market to make me jump, sell these devices and buy a new one. But the question is, if you do not have any UMPC, what would you pick? Difficult question. Like Warner, I already know that A110 is not for me. At least using Vista. So that leave me one option, the new Asus R2Hv. That would be the machine that I would recommend to people looking for UMPCs today. But of course, I'm looking for performance. If somebody is asking me for battery life and good enough performance I would recommend the Q1U with XP installed. In fact, any A110 with XP installed would be good enough for 90% of the users out there. The HTC Shift with XP would be a really good machine for many users, probably even better than the Q1U-XP. That's what I would recommend to other, I... I will for the next round. I'm pleased with my Q1 after all. Very pleased. I underlined those points that I think are affecting directly our UMPCs, as you can see that's more than 50% of the points that will be addressed in this service pack. TabletKiosk has posted the bad news in its forum. I'm sorry to inform you that TabletKiosk has no formal plans to release drivers for the eo i7200 series to support Microsoft’s Windows Vista. While the eo i7200 series was certified by Microsoft as "VISTA Compliant", TabletKiosk never released this unit with this operating system nor were we able to secure the proper source code for either the O/S or chipsets required to complete these drivers to a level that we found to provide an acceptable computing experience. Well, that confirms what I said back in this other post, Founder, the maker of these devices did not have any plans to release Vista Drivers for these devices. That's how businesses work in China, they change plans and they do not give you any explanation. Well, at least this is my personal opinion. Without Founder support there was nothing that could be done by TabletKiosk. Windows Vista Team Blog has just officially announced Vista SP1! What is SP1? What is it not? In addition to updates we’ve previously released, SP1 will contain changes focused on addressing specific reliability and performance issues we’ve identified via customer feedback, supporting new types of hardware, and adding support for several emerging standards. SP1 also makes additional improvements to the IT administration experience. We didn’t design SP1 as a vehicle for releasing new features; however, some existing components do gain enhanced functionality in SP1. More information on what’s included in SP1 can be found in the detailed white paper. According to the same page, the SP1 of Vista should be released in the 1st quarter of 2008. That's what Daniel did and wonderfully explained in this article. And you may think, why somebody would want to go up to these extremes. Well in this case he used one of the ports to add an extra 2 GB USB Memory drive that he is using now as a Readyboost drive! TabletKiosk, one of the most important American sellers of Tablet PCs and UMPCs have opened their own forum. That's a good move! Good Luck in this new adventure TabletKiosk!
" It is KOHJINSHA service center. Our company becomes a response only of Japan. Please continue your favors toward understanding above." It seems to me that this is one of those devices that we never are going to see here in USA neither in Europe. How long they have been showing this device? A year? 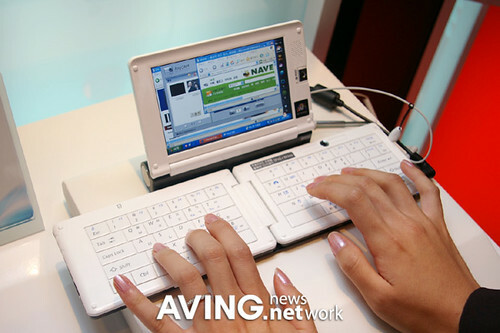 Samsung Electronics unveiled its compact UMPC 'Deluxe MITs(model: SPH-P9200)' at the Samsung 4G Forum 2007 in Korea market. As a successor model of SPH-P9000, it can connect to wireless Internet and VoIP phone via Mobile WiMax. Running on Windows XP, the SPH-P9200 adopts 5-inch touch screen, folding QWERTY keyboard and 30GB HDD. Yes, our friend Steve has finally make peace with our big brother the Sun and has started is "solar adventure". Of course we had lots to talk about but I held back on saying too much about UMPCs. On the way back he was telling me how pocket PCs don't have the right OS, how the communicator has the same problem and how he wanted a small windows XP (not Vista - he still has some DOS programs that need to run) machine. 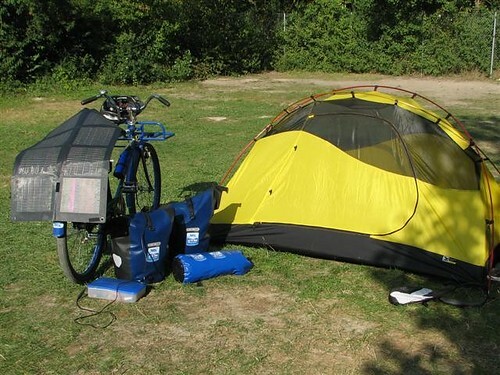 When I showed him the Q1b back at the tent he was amazed and when I connected to the Internet on the spot he couldn't believe it. I passed my card over and smiled saying that I hadn't expected to be promoting UMPCs face-to-face on this tour! I have been reading his comments and thinking for myself, would I do something like that? I would like, but I think that I'm too old already. James, every day Vista runs just fine on my original Q1. I’ll put my app usage up against anyone but a developer. Every day I run Outlook, ERP, SQL, Firefox/IE, Excel all at the same time, often with Live Writer and OneNote open too. I agree that 512k isn’t enough. 1 gig of RAM ran fine for me. 2 gigs in the Q1 is beautiful. I hit 100% on the processor long before I use up the RAM now. I also agree that the new Intel mobile processors, the A1xx series, can’t keep up. I think they were a response to the threat from VIA and that they sacrifice too much performance for a boost in battery life. The above is part of an article published today by Mark at Ultranauts talking about another article published today by James Kendrick from JKonTheRun where basically he was saying that Vista was not the best OS for UMPCs. Vista will not run well on mobile devices in the foreseeable future. What I think about these two articles? My opinion is mixed. I agree with Mark in most of what he said. I'm too currently running Vista in my Q1 which run about 40% slower than the Core Duo processor which according to James is the only processor capable of running Vista and I'm very happy with the way it performs. I would like a better performance when I'm using "movie maker" but hey! this is a UMPC after all! Like Mark, I do not have all those problems described by James in his article and like Mark I'm also confused when I see that James still use UAC. James, you have lived your whole life without that tool. Believe me, you don't need that. 50% of all your HDD trashing probably is produced by UAC checking and rechecking everything you do. So where I agree with James and disagree with Mark? In a very simple point: Mark and me have spent sometime optimizing the system and I, like James, do not think that customers should optimize the OS before they can enjoy the benefits of it. Performance should be there since the first minute you turn your UMPC on. The average Joe does not know how to stop UAC, how and what services can be stopped because you are not using them and probably will never us them -who the heck is going to connect a 56 kb modem to an UMPC to send and receive faxes?- or how to open the registry and changes "undocumented" keys. I do think that the Origami team should play a more active role. They had already some experience in OE for XP where they optimized the OS for the touch experience, so my question is, why not optimize Vista for a better performance in UMPCs? Why not make that a part of a new version of Origami Experience? I hate to say this but I agree with James. While I consider Vista the best OS for UMPCs and I do not have any major performance issues with Vista, I do not see at this moment any UMPC with Vista installed ready to hit the market. The performance of UMPC with Vista installed right out of the box is just BAD in upper case. And OEM should work with Microsoft to bring to the market not just the "latest OS" but the "Better OS" we have seen running in UMPC and Tablet PC devices. Yes, Jeremy is back posting at Origami Project Blog. This time talking about his latest experiences with some BT accessories. I'm back to using BT which is a good thing. Engdget is reporting and confirming that the iPhone is not anymore for AT&T users only! The iPhoneSIMfree.com team called us up to prove their claim that they cracked Apple's iPhone SIM lock system, and prove it they did. (No, we don't have a copy of the unlock software, so don't even ask us, ok?) The six-man team has been working non-stop since launch day, and they're officially the first to break Apple's SIM locks on the iPhone with software. It's done. Seriously. They wouldn't tell us when and how they would release it to the public, but you can certainly bet that they'll try to make a buck on their solution (and rightly so). We can hardly believe the iPhone's finally been cracked. No, scratch that -- we just can't believe it took this long. is illegal to unlock your iPhone? Look, there are a lot of legal issues surrounding unlocking, but the most applicable law in the US is everyone's favorite piece of legislation, the DMCA. Just like any other piece of code, the iPhone's firmware is protected by the Copyright Act, and circumventing the access controls in place to get at that code is a violation of the DMCA. However, the Copyright Office issued six exemptions to the DMCA last year, one of which allows consumers to unlock their cellphones "for the sole purpose of lawfully connecting to a wireless telephone communication network." But do not be so happy, there are a lot of but... check engadget. Ok, since Yesterday ultramobilepc-tips.com was moved to another server. This does not mean anything for most of you but still, there is a group of you that probably are missing some graphics like for example the one that usually shows up in the header of this page. This is a usual dns propagation issue and it fixes by it self in few hours. Nothing that can be done about it. There could be some pages not accessible for some of you and that's the same issue. I apologize for the inconveniences that this could have caused to any body. VIA Announces New processor running at the amazing speed of... 500MHz! According to VIA this processor use only 1 watts, if used in a device to total around 10 watts we should see twice the battery life that we are used to see in current VIA UMPC. 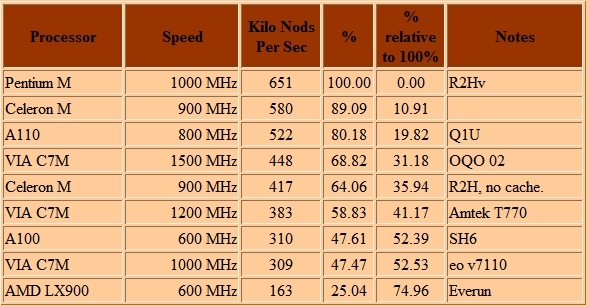 Now check this table, as you can see it takes 1500 VIA's MHz to reach a performance close to a 900 MHz using no cache at all, like the one used in the old R2H. So in another words, there is not way this processor could be used in any Windows UMPC -thanks God all I would die from a heart attack. A 500MHz processor isn’t going to be enough to run, say, Windows Vista on a UMPC but it’d be just fine for running an embedded version of Linux or similar proprietary operating system. The big draw here would be extended battery life. Typical UMPCs draw around 20-25 watts of power so if you were to use a system with this new VIA chipset totaling around 10 watts, you’d get about twice as much time between charges. 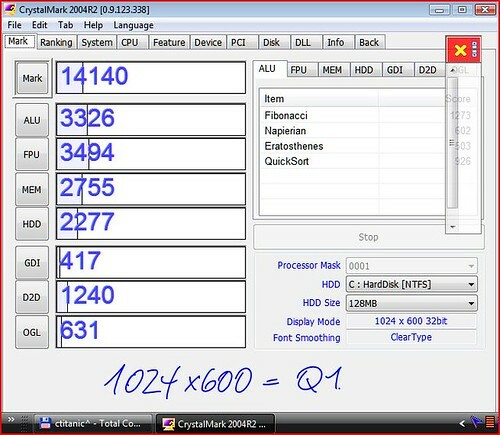 Now you see why did not applaud Intel's A110 processor. Too bad example. PS. Thanks Steve for the correction. The table has been updated again. Now with almost all the CPUs. The Kohjinsha SH6 processor A100 has the same score than my old eo v7110 where I had installed Vista for a while with a 7200 RPM HDD and 1 GB of RAM. Intel's graphic chip is a lot better and it use 256 MB of RAM so that explains why Vista performs better in the SH6 than in my eo v7110 with only 64MB of Video Shared Memory. These numbers have given me another dimension to compare all the machines in the market. Will I buy an UMPC just using these numbers? Of course no. Choosing an UMPC is like a complex equation with many variables. But definitely the CPU and the Chipset play an important role in my equation. And I said my equation because in somebody's else equation probably battery life is more important or just the external design. Our friend JKK has posted a very detailed video review about the Kohjinsha SH6. What I have to say about this review. Well, I'm very impressed with the abilities of JKK to optimize Vista. I remember a conversation where I said that I have around 70 processes running in my Task Manager and JKK replied back that he has around 40 and that he could not use a machine with 70 processes running at the same time (JKK, please,correct my numbers if I'm wrong). Well, I could say the same thing, I have 70 processes because I need them and I can't function without them. And I say this because there is where I see the problem. How slow will become Vista on that machine when you have 70 processes or 60 processes running at the same time? PS. 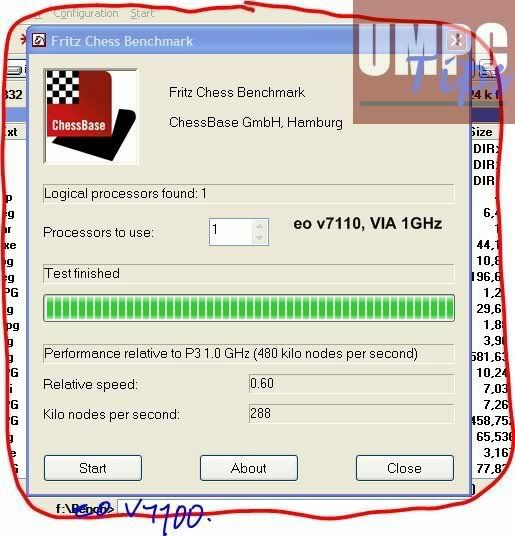 Could you send me the Fritz Chess Benchmark result screen shot? I want to update my table with that processor and without any doubt your score will be the higher that I could probable get from that processor. Thanks in Advance. I keep updating the Fritz Chess Benchmark table. Today I added the information for the Intel Celeron 900 MHz without cache used in the Asus R2H first generation. Probably many of you have read me saying that the R2H was the slowest machine using an Intel Processor from the first generation, well, this has been confirmed again with this test. As you can see, the Intel Celeron without cache score slower than the A110 and VIA C7M. I'm still waiting for the results of this test that Chippy promised to send me, the AMD should score close to the VIA used in the eo v7110, I believe. 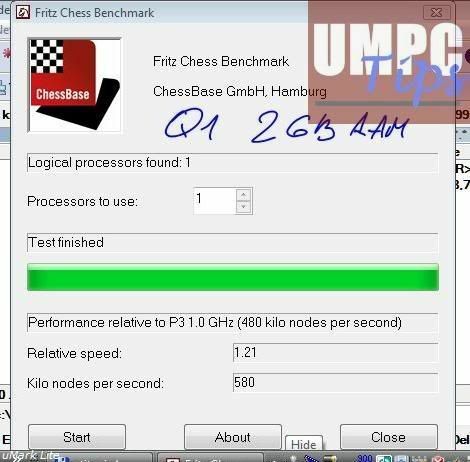 I received the results of Fritz Chess Benchmark for the OQO 02 at 1500 MHz. The result is 25.33 less than the result of the same test in a Pentium M but it's close to 25% higher than what we saw in the eo v7110. 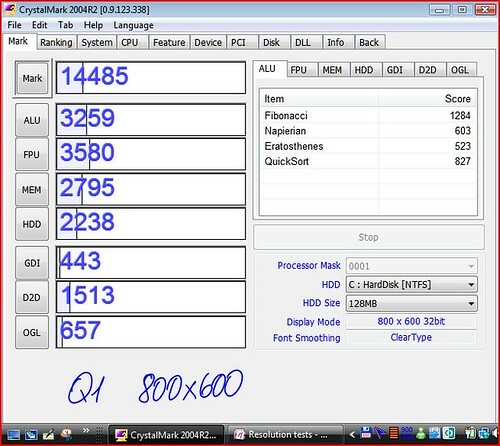 Now we can say for sure that the OQO 02 is slower than UMPC using Pentium M, Celeron M and the A110. I created a new table in my benchmark page with all these results. Thoughtfix is waiting for his HTC Shift but he still working with his old eo. This time he has came with one of the best desktop mounting solution I have found and more comfortable ones. The eo models have a mounting bracket option which can be used with or without a quick-release. In the above picture, I am using the Universal Mounting Plate for the eo v7110 (also available for the eo v7200 series) in conjunction with the Universal VESA Plate and a standard desk clamp VESA monitor arm. 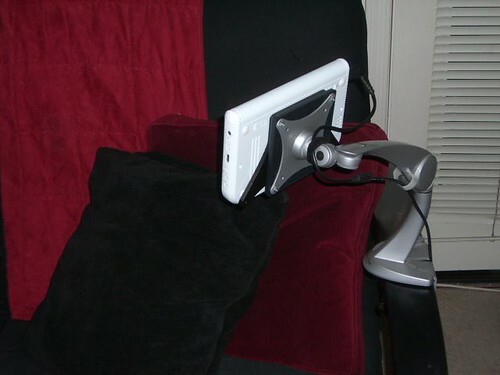 My monitor arm is rated up to 18 lbs so has no problem keeping the UMPC steady. That's the main point and the reason why I keep talking about the A110 which I consider a step backward. I never have claimed -neither James and Kevin- to be a hardware expert or to know more than anyone about processors. This is why a comment like this is really appreciated. It has been reported that the 915 chipset apparently supported Aero in MS Vista Beta's, however the drivers are not recognized by Microsoft as Aero capable in the final version. The number of computers with the Intel 915 chipset was very large, and all of sudden it became obsolete, generating in some cases an artificial demand for the Core Duo and Core 2 Duo computers with the newer 945 that fully supports Aero. At some point it become obvious that the VIA mobile chips are very power efficient and require less space, making them ideal for UMPC's. The OQO 02 is much smaller than the Sony UX or Fujitsu U1010. The VIA based Q1B has better battery runtime than the Q1 and Q1P. Intel's response was the A110, basically the same 90nm Celeron M 900 MHz (353) found in the Q1, with 100 MHz lower maximal core frequency and SpeedStep technology. I'm not 100% sure, but there is evidence that the "new" A110 consumes less most of all because it's lower clocked, it's not an advance. I mean, Intel should have used the 65nm process as the base for the new chip, there was no reason to use 90nm. Having a smaller core it would have more potential to consume less. Also the the new chip should have SSE3/VT micro instructions, perhaps AMD64 too. Very soon there will be some problems to address more than 2GB RAM with 32 bits technology, also 64 bits OS and applications should run faster. I personally find A110 based Q1 Ultra acceptable, I have said before that the 353 Celeron M had enough performance for an UMPC. Also it's great that they have added SpeedStep. But, being a new processor, Intel should have made something better than the older chip. Not only focus on consumption. How fast is your processor? Recently I have been involved in a series of discussions about performance and processors speed. And in all these discussions people use words like "slightly slower", "a little bit slower", "not that slow", but up to this moment I have not seen anybody presenting a real number, a result of a real test. There are many benchmark programs and all of them include Processors tests but sometime they are hard to read and harder to compare the results. 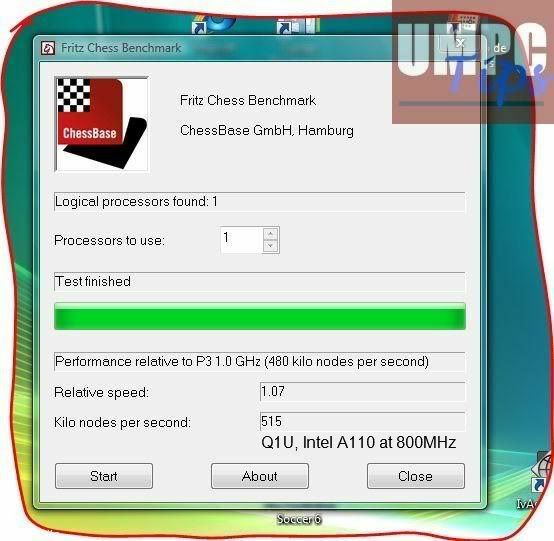 So I started to think about an easy way to show exactly how slow is a processor compared to another and I remembered then about a Chess program that I used back in the 80s: Fritz. That program has a benchmark option to measure how many positions a processor can calculate per second. This test only measure that and it does not depend on the memory installed or any other hardware parameter. 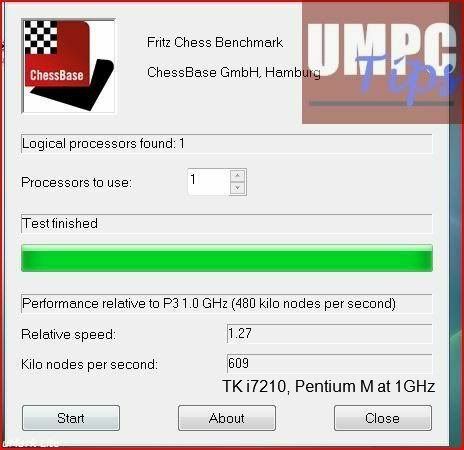 Then somebody pointed me to this program which does that and only that, it checks how many chess positions per second any processor can calculate. I ran the program in my both UMPCs, the eo v7110 and the Q1 Celeron and I asked a group of people to run it in Q1Us (A110) and a eo i7210 (Pentium M). I gathered all the reports and selected the best results in each case. I have to say at this point that all the results for a single device were very close one to another. And that's normal because the only thing that could may this test to have different results is the processor being used while the test was running. This means that for a higher score you had to be sure that there was not any program using the processor at that time. That's all. So here are the screen shots of the results that I have selected. I have prepared a little table with these results and some calculations. The column in the right shows how slow is any Processor compared to a Pentium M running at 1000 MHz used in the first generation of UMPCs. This could be not the best way to test how good is a processor but at least is one of the simplest one I have found. If you know of any other method I'll be glad to test it and gather again all this information just to have real numbers to compare each processor. Yes, Chippy has managed to install a HSDPA miniPCI card in his Everun that's the good news, the bad news is that he took it from this Q1b! Poor Q1b! Here is a short video of him talking about it. Time for another useful powertoy! This addin, written by our own Jeff Cardon, merges selected pages together. It is about as simple as it sounds: select the pages you want to merge and click the merge toolbar button. With few words but a lot of pictures in a unique style JKK has posted about an autopsy done to a kohjinsha SH6. Dynamism is taking pre orders for the HTC Shift, $1499. The UMPC field is becoming a little bit like modern politics: there is a race to the center. Traditional big notebook makers like ASUS and Samsung have been releasing small and impressive UMPCs. As they try to shrink their PCs, phone makers have been trying to bulk up and add more power to their phones (especially Windows Mobile devices). Nobody has pushed smart phone functionality farther and harder than Taiwan's HTC. HTC recently released the HTC Advantage, which is the most capable Windows Mobile device to date. Now, HTC has gone all the way to full-fledged UMPC. I like that: The UMPC field is becoming a little bit like modern politics. For example, the 945 Graphic Chipset is not really a lot better than the 915 and you have it running at 1024x600 while the old devices using the 915 were using 800x480. So what ever that chipset added in performance to the new generation is gone because of this higher resolution. So from the point of view of graphics both generations are almost at the same level. The higher the resolution is the higher is the processing power needed by the graphic chipset. That's something mathematical. So, if you have two graphic chips, one better than another but the better one is running at a higher the resolution that the less powerful one, from the point of view of performance you may see both at the same level. So far, I do not see anything hard to understand on this. Well apparently, somebody at Origami Project thinks that I'm wrong. lastly... ctitanic,your argument about the graphic card.....priceless!! Before I continue, let me translate the last two sentences. A "Gallifante" was a little doll created by Miquel Obiols and it was the main prize of a Spanish Television program for kids in the 80s. The last sentence translate: "keep going champion." As it can be seen from these tests, the resolution does not affect how the CPU works but it does affect the video chipset performance. Sigue así campeón! Cuesta abajo y sin frenos! Translation: keep going champion! keep going down of the hill and without breaks! The U810 - U1010 or better known as the Stormtrooper is running thru the FCC site. Looks like the device is going to hit a nice price point of $999.99 US. That would be a GREAT price point for this type of a device!!! Look for a release around September 18th on this here in the US. If you want to be really mobile with the Stormtrooper, you'll have to wait a little longer for the HSDPA model - That won't be till Q1 of 2008.
jkOnTheRun: Did Intel pull a fast one with the A1xx processors? That's not a good thing for Intel as devices have starting appearing using the current A1xx processors. There are currently two flavors of the A-series that run at 600 MHz and 800 MHz. You would think that using slower processors would be a boon to battery life but I am the first to admit I am disappointed in the performance of these new processors. The A110 brings a better battery life, in the old Pentium M the maximum you could have got was around 2.5 hours, with the A110 I have seen reports of more than 3 hours. But as you can see, we are talking about 30 to 45 minutes more of battery life. But there are many factors than need to be analyzed. For example, the 945 Graphic Chipset is not really a lot better than the 915 and you have it running at 1024x600 while the old devices using the 915 were using 800x480. So what ever that chipset added in performance to the new generation is gone because of this higher resolution. So from the point of view of graphics both generations are almost at the same level. Taking this in consideration what's left? Pure processor power and in this case both processors have a common architecture and you have the A110 running at 200 MHz less than the Pentium M used in the old generation. So... there is nothing weird in getting around 20 to 15 % less performance. In my opinion, Intel did a good job making a processor that could mimic current VIA processors in the market. That was the goal. To have a processor that could give the same battery life and bring about the same performance than current C7 from VIA. And they did a good job on that. You have to look around and read the news of about 6 months ago. You had news about HTC putting a VIA processor in the Shift, you had news about the OQO 02 using a VIA processor, you had news about the Mediom UMPC using a VIA processor. So under that pressure the only logical and fast move was to take a Pentium M and modified a little bit decreasing performance up to the same level than those VIAs and getting the same battery life. Keep in mind that there were two big complains from the press about the 1st Generation: Battery Life and the absence of Keyboards. And this Second generation tried to address both "issues". Another factor that you have to take in consideration is the OS. This second generation was released when Vista was released and this coincidence had bad consequences. Vista is not the best OS neither for the A110 or the VIA processor. And there are the benchmarks to prove it. Those who installed XP in these machines have a lot better performance. To have Vista running in any of the first generation or second generation machine running at a descent performance you have to spend hours of digging in the OS configuration to set it right. And that's what OEM have failed to do. They just installed the OS and added their crapware to make things worse. So as results of all these facts all you get is a second generation that disappoint many because of it poor performance. Like James says in his post, if you look around every single review about the devices using the A110 say the same thing: they are slow. I have disabled the comments at Ultramobile PC Tips Blog and instead of that I'm posting the link to where you can discuss every news at my recently opened forum. Using the forum users will have an easier way to keep track of replies made to their comments. I apologize for the inconvenience this may cause to some users. Brandon LeBlanc recently posted at The Windows Experience Blog how he produce the videos he usually post in that blog. The article is very good with details around the whole process. As you probably already noticed, I've been doing quite a bit of posts that include video demos of devices and software in my posts. A few folks have asked me how I produce these videos and I'd like to outline the exact process I use in producing these videos for a blog post. I still working in Pocket PC applications and as part of that I read a lot of news about that platform. Today I found about this tool. "zoomVNC is a cutting edge VNC (Virtual Network Computing) client for PocketPCs, allowing you to access machines remotely while out on the road or simply away from your desk. Featuring modern protocol support, macros and zoom, you can control any type of system remotely, using on-screen keys to support macros, key combinations or unusual modifier keys, zooming in from whole screen to 400%, and hardware keyboard support." This application is probably a great tool but check the above screen shot. Do you see how little space is left in the screen to work with this PPC version of VNC viewer? 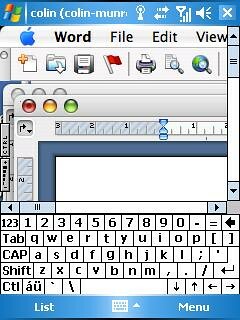 One of the tools I use often in my UMPC is the VNC Viewer and I love how it works on it. Even at 800x480 still enjoyable. What happened to this device? I don't care about the low resolution and I do not care if I get only 2 hours of battery from that processor. The only thing I would add is more memory. This is the craziest thing I have read in a very long time. A man had his thumbs surgically altered to use his iPhone. 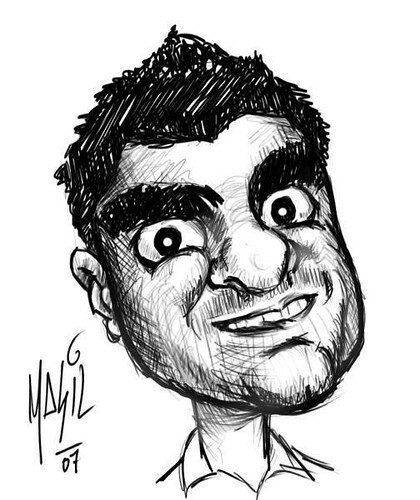 "From my old Treo, to my BlackBerry, to this new iPhone, I had a hard time hitting the right buttons, and I always lost those little styluses," Martel told the Post. I still can believe this news. Would you go up to this extreme? Would you like to use your UMPC as a phone? I was reading this post at Pocketables.net and reading the following fragment made me think: do I really want to have a cellphone integrated in my UMPC? Personally, I don't see the point of putting a semi-smartphone ("semi" because there aren't any cellular calling features) into a comparatively large UMPC. Since the Shift can't be used as a phone, you'd still have to carry a phone. I don't think so. I really prefer to have my phone and use it as a modem or my UMPC with a data connection like it's in the HTC Shift or with a WiMax internal modem. If you ask me why is that I would say that one I think of an UMPC with a phone integrated on it that reminds me the iPhone locked to AT&T. Yeah, I know that probably in the near future we will see hacks to unlock the iPhone but... do I really need another aggravation in my life? In another hand, the type and size of UMPC that I like is really not that comfortable to have it using it as a phone. I know that the idea in those cases is to used with a BT Headset but that does not convince me either. But you, my dear reader, what do you think? Do you like the idea of having your cellular phone integrated to your UMPC? Vote in this poll. A whole month of battery life! Can you imagine that? This power bank reported by AVING USA can do that for you. Samsung SDI is showcasing its portable power supply ‘Fuel Cell’ at the company’s showroom ‘Sdium’, which enables you to use your notebook pc up to for a month. This is why I always say that it's more important for me performance than battery life because you always can find a solution for your power needs but you can't do the same with a bad performance. Price and availability still known. Thanks to Hugo Ortega of GottaBeMobile and his amazing video on the HTC Shift, I have decided that my next year of blogging will be primarily featuring this device. I contacted my PR Rep in HTC (whose last contact with me was on April 3 saying "Wait for late summer") saying I have every intention to purchase one when it is available. Did not I say that this device was expected by many people? Here you have one of them. Yesterday he brought us the HTC Shift, today he is bringing us a nice review about another machine that many people are waiting for because of it's proven design: The Fujitsu U1010. The Fujitsu U1010 is a special machine. I blogged about it being a real kiddie pleaser and with mixed emotions I can report that I still feel the same. It is so small, so cute, and so overwhelmingly concise that it makes other UMPC almost seem featureless. The screen converts, the keyboard types (albeit better with thumbs) and the screen really does favor the pen input! The Second Generation is represented so far by 3 machines: the Q1U, the HTC Shift and the Fujitsu U1010 (I consider the OQO a mini Tablet PC). Which one do you prefer? Oops he did it again! This time he came back with a full review of the HTC Shift for many the most anticipated UMPC of this year. "I had The HTC Shift for a little over 60 hours and was able to play with many of its great features, which include Pocket PC, HSDPA, Vista Business, Tilt Touchscreen, QWERTY keyboard and more. It is an incredible device with many possibilities, this video will hopefully showcase some of that. I managed to literally squeeze it into a very tight schedule I am running at present and did what I could to cover off some of the burning questions folks might have". This machine will be for many the perfect machine... I... I will wait for the next pass. After 9 years participating in forums, more than 25000 posts on all of them and moderating two forums, I have decided to have my own one: UMPC Tips Forum. The forum was already there with the How-to Section of this blog and Today it was moved to our domain ultramobilepc-tips.com and modified with new sub forums and categories. I know that we have already some forums about this topic out there so I tried to make this one very simple or the simplest to use. My hope is to see this new community to grow with old and new friends. To have my own place where to learn from others and share the little that I know. So Here it's. Mi casa es su casa. Celluonis about to release a second generation of its laser keyboard which now includes USB connectivity added to the already existing BT one. 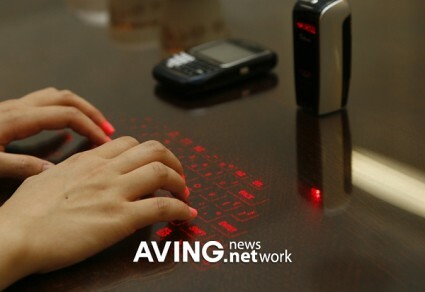 Celluon (www.celluon.com) expects to launch its virtual laser keyboard ‘CL850’ in Korea market in early-September, which offers similar input environment with existing keyboards. The CL850 is portable input device adopting the company’s sensor module which recognizes locations and movements of fingers and transmits the inputs recognized by the sensor to user’s device. As a successor of CL800BT, it adopted Bluetooth and USB connectivity with which you can connect the virtual keyboard to your desktop pc and other mobile devices such as laptop and PMP. Microsoft will be releasing 9 updates, 6 of them critical the next Tuesday according to a post at Microsoft Security Response Center Blog. · Six Microsoft Security Bulletins affecting Microsoft Windows with a Maximum Severity rating of Critical. These updates will require a restart and will be detectable using the Microsoft Baseline Security Analyzer and the Enterprise Scan Tool. I have to confess that I have not tested this program because I'm not synching anything at this point. If you use your UMPC as your main PC then at one point or another you will need to synchronize your files with another PC or external HDD to keep a backup of it. This tool could be good or bad, I don't know but what I know is that today you can get it for free here! SyncCopy is the powerful sync tool designed for Windows 9x/Me/NT4/2000/XP/2003 you have been looking for. It makes a same copy of your data files to another directory, disk or computer across the network. Perhaps you’d like to continue your work in office and home or coffee bar, you’ve deleted some file or create some new file, you need all file keep same exactly. SyncCopy can help you with all these tasks and more. I have been thinking and, excuse my French, that the whole Solar Project in Europe is a mental masturbation. So I have started to look for some more "European" alternative to help our friend Steve is his project and thanks to Clipset.net I found this very useful way to charge a phone. 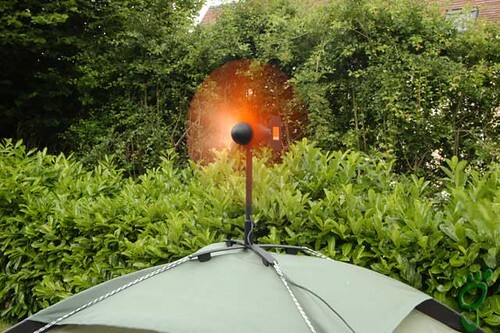 Orange commissioned gotwind to build a working mobile phone wind charger prototype. I said poor v7110 because what our friend Daniel want to do to his v7110 is very close to madness. What are they odds I can fit the thing above INSIDE my TabletKiosk eo v7110? It'll take some solder, plastic cutting, and creativity... but it could be possible. Internal Flash storage and/or ReadyBoost. Mmmm. 24h SALE: GET 60% OFF ON PDF ANNOTATOR! great software deal a day. It's Bits (anything digital) of the Day. Every weekday, they feature one program or service at a substantial discount. About PDF Annotator: PDF Annotator lets the user open any PDF file and add annotations, using the keyboard, mouse or a Tablet PC pen, directly on the PDF file's pages. The annotated documents can then be saved directly back to PDF format. Like I said before, it's not a PPC, it's not a Smartphone, it's not a UMPC...It's the HTC Advantage! This update resolves issues that may affect some Windows Vista-based computers. These issues have been reported by customers who are using the Error Reporting service or Microsoft Customer Support Services. By applying this update, you can achieve better performance and responsiveness in various scenarios. This update also improves the reliability of Windows Vista. This is the update leaked about a week ago now officially released by Microsoft. I don't have any doubt that it's fixing things but like I reported, I have not noticed any performance differences in my Q1. Here is a tip that really speeded up my Q1 with Vista Business, I ran CrystalMark before and after this tip and the score went up for around 600 points. But that's not all, I feel that now applications open a lot faster. Vista ships with other features that are listed separately in the operating system from the startup services. Remote Differential Compression - Remote Differential Compression (RDC) allows applications to synchronize data between two computers in an efficient manner. The synchronization efficiency is made possible by using compression techniques to minimize the amount of data sent across the network. After all your UMPC is not part of a network the whole time and believe me, when it's connected to your network probably you wont notice any difference from not using this service. At least I did not notice any in my tests after applying this tip. Windows DFS Replication Service -According to Microsoft "The DFS Replication Service (DFSR) Management Pack for MOM monitors the DFS Replication service running on Windows Server 2003 R2 DFS Folder targets. This management pack monitors the events collected from the service that indicate the health of the service, replicated volumes, replication groups, and replicated folders. It also has consolidation rules that monitor frequent occurrences of certain conditions such as sharing violation, conflicts generated etc." Again, Your UMPC is most of the time not connected to a network so you can live without this feature. These are the kind of tips that most of us are waiting from Origami team but they have virtually disappeared. Looking at these services you can see that Vista is not configured at all for being used in a UMPC and who knows better Vista than Microsoft? Origami Experience is Ok but many current owners will appreciate more a program or guide optimizing Vista for UMPCs than a new version of OX. That's mine opinion. It's not a Smart Phone, it's not a Pocket PC,its not a UMPC... It's the HTC Advantage! BELLEVUE, Wash. – Aug 7, 2007 – HTC Corp. (TAIEX: 2498; "HTC"), the world's leading provider of Microsoft® Windows Mobile®-based smart devices, today announced the U.S. retail availability of the HTC Advantage. As one of the smallest mobile computers available, The HTC Advantage delivers extreme portability that leverages the mobile office strengths of Windows Mobile 6 and advanced wireless connectivity in one of the smallest mobile computer designs available. "The HTC Advantage will challenge the way people think of mobile computing," said Peter Chou, chief executive officer of HTC. "Based on customer feedback, the Advantage is a mobile computer that includes a large display and increased memory while keeping the portability and global 3G connectivity of HTC’s best devices. Building upon HTC's strong track record for bringing cutting-edge mobile devices to the market, the HTC Advantage allows customers to bridge the gap between being mobile and being in the office." With nearly a decade of experience designing and building pioneering Smartphone, HTC is extending its mobile convergence leadership into a new mobile computing category created by the introduction of the HTC Advantage. Adding powerful functionality and advanced connectivity in compact and innovative designs, the company is now doing for mobile computing what it did for mobile phones. The HTC Advantage is now available through CompUSA and Amazon.com for an approximate retail price of $899. Since its establishment, HTC has developed strong R&D capabilities, pioneered many new designs and product innovations, and launched state-of-the-art PDA Phones and Smartphone's for mobile operators and distributors in Europe, the US, and Asia. These machines are available as HTC devices and as products individually customized for operator and device partners. Now the question is... what about the HTC Shift? Why I'm defending this platform. Dear Steve, let me try to answer your question the best I can. Why are you guys so worried about defending this platform or that one? The Q1U is unimpressive; the UMPC is unimpressive. I'm defending this platform because I believe on it. I have been a Pocket PC owner and developer for the last 4 years and I could not find on that platform what this one is bringing me now. #1 problem - Windows as an OS. MS needs to tailor an OS specifically to these devices for performance and display. Sounds good, but... What do you want? Something like Windows CE where you can run only applications converted to this platform. I have been there and I really don't like the idea. One of the reasons why I'm using a UMPC is because it use the same OS that I use in my desktop computer. So what seems to be a problem for you is what I have been looking for since long time ago. #2 problem - Unix as an OS. The popular apps are windows apps. If unix had windows apps - game over. But that's not a problem only present in Linux. Like I said before, smartphones and Pocket PCs are suffering in part of the same issue. So this is why I preferred to have a small device capable of using the same OS I use in my Desktop. It's not perfect but features like Hibernation and Standby allows you to have something close to an instant on, one of the features more asked for everybody. #3 problem - UMPCs need to be able to run Google apps and Skype. The Nokia Internet Table cannot. What you call Nokia Internet Tablet is not a UMPC is what we call a MID (Mobile Internet Device). And I agree with you, and that's the reason why I'm using a real UMPC, because I can run Google Apps and Skype on it. #4 problem - Lousy battery life! If you can get a laptop that does 8 to 12 hours what's wrong with the UMPCs? In one year we have jumped from 2 or less hours to 3 or 3.5 hours. But this battle is not an easy one. Look around and check how many Notebooks currently have more than 4 hours of battery life. You will count them with your fingers and you will have enough of them. So I really don't know about those "laptops" where battery last from 8 to 12 hours. One of the smaller minitablet that I know is the Fujitsu P1610 and it has a battery life of a little more than 2 - 2.5 hours. To have a longer battery life, keep the price low, have a performance of a subnotebook and have a really small size device is not an easy task. Give the platform 2 more years and you will get what you are asking for. #5 problem - UMPC input may be the most important of these problems in terms of marketability. People want a keyboard - period. They want a real keyboard or something 90% or more of real. The Newton had a wonderful keyboard, Samsung has a beauty too and the NEC MobilePro & Sony PictureBooks were pretty good. People asked for keyboards and they are getting keyboards. Check the Fujitsu U1010 or you don't know that device? We have at least 3 different kind of keyboards already integrated to UMPCs. Some more efficient than others but they are there. #6 problem - screens are unusable in bright light/daylight - there's technology to solve this problem. The screen on the Q1U is a lot brighter than the screen used in previous models. It's not perfect outdoor but it's better than what we have one year ago. The use of an outdoor display will increase the price already high of these devices and at this moment everybody wants to keep that price as low as possible. But to be honest, 80% of users do not work with their UMPCs while they are taking a sun bath in Miami Beach. Newton, NEC MobilePro, Sony Vaio Picturebook, the Toshiba Libretto and others were all lightyears ahead of the current crop of UMPCs in terms of usability. Stop defending bad thinking and trying to make a lousy BLOATED OS try to run on these underpowered toys. You are mixing devices that are in different categories. They were good but in their own way. UMPC is a whole new category smaller than a Subnotebook and bigger and more powerful than a Handheld device. It's a young platform that's getting better every all the time. Any other question, Dear Steve? And always remember one thing, what looks bad to you could be the best thing for others. 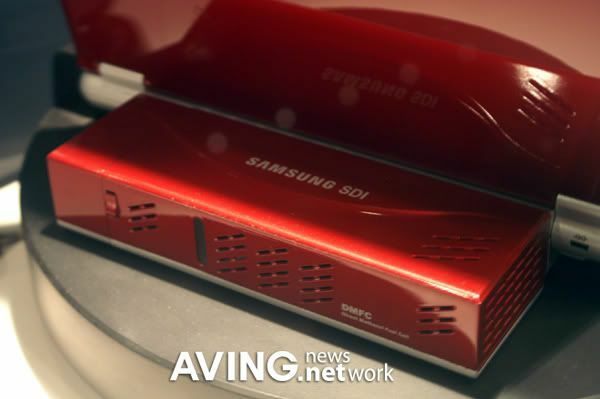 The Olympian Online newspaper has published a review of the Samsung Q1U. THE BOTTOM LINE: Despite making improvements to its UMPC, Samsung still has work to do. The underpowered Q1 Ultra is best used for on-the-go Web surfing, but there are better and cheaper devices for that specific task, including that new device from Apple you may have read about recently. My guess is that the "the new device from Apple" is the iPhone. I know that I have been saying multiple times that the processor used in the Q1U is "slower" but it's just 10% than a Q1 Celeron running on Vista if you install XP on it and you optimize it. To say that the Q1U is just good enough for web browsing and compare it to an iPhone only tells me that the author did not do his homework. The Q1U could be slow but not enough to not be considered a PC. As in any PC you can install what ever program you like and you will get from the Q1U a acceptable performance to run 90 of all the applications in the market. But... as far as I know... You can't do that with an iPhone. All you can do with a iPhone is playing music, list pictures, use it as a phone and "browse" the web at the same speed or worse than in an old 56kb modem. Can you edit or change in anyway pictures saved in your iPhone. No, you can't. Can you rip a Music CD to your iPhone without using a PC? No, you can't. Can you even listen music in your iPhone without a PC? No, you can't. You need a PC to activate the iPhone before you start using it. Well, the Q1U can do all that and without the help of any other PC. So, no, the Q1U is not an iPhone, it's a UMPC and UMPC are meant to be companion PCs so for a large group of consumers the Q1U is powerful enough to handle all their needs. There are another group of geeks like me that need more performance but even this group is aware that you wont see the same level of performance in a UMPC like you have in your Desktop PC. The technology is not at that level of efficiency yet. Did the patches change anything? You probably remember this post about some patches leaked that were supposed to improve Vista performance within other things. And I know that you are probably waiting for somebody to test them in a UMPC. Well, I did it. I have not noticed anything positive neither negative. My benchmark tests have not changed so I can't say that these patches improved the overall performance of my Q1. The time coming back from standby or hibernation still the same. It takes the same time to turn on the device. This does not mean that these patches did not do anything. They just did not change the performance in any way. James from JKonTheRun just received a OQO 02 and is getting it ready for a test drive. The unit is beautifully designed and constructed and while it does get warm it's not uncomfortable to hold, even while it's banging the hard disk a lot. The keyboard is nice and backlit with an ambient room light sensor that controls it which is a very nice touch. Linda Epstein has just published a very complete review of this accessory which seems to me a very good companion for any UMPC. CardScan Executive is one of the most valuable tools any business professional can have in their office. If your a road warrior, the CardScan scanner is small enough to take where ever you go. Attach the CardScan scanner to your Tablet PC or UMPC at home, in an office or in a hotel room and the task of scanning in business cards becomes part of your daily routine.